The 3M(TM) Protective Coverall 4540+ is disposable safety work wear made of a high quality laminated material with a breathable back panel for improved air circulation. Helps provide barrier protection against light liquid splashes and hazardous dusts. 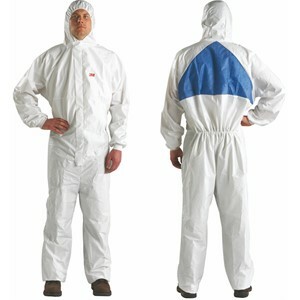 The key features make this protective coverall a great disposable PPE option. The 3M protective coverall 4540+ helps protect against light liquid splashes and hazardous dusts. Typical applications for this safety work wear may include: Paint Spraying, industrial and Pharmaceutical Processing, asbestos inspection, insulation laying, and vehicle and machine maintenance (oils and greases). Product recommended for the following industries: Abatement/Remediation, Agriculture, Cleaning and Maintenance, General Industry/Manufacturing, Non-Hazardous Operations, Painting, Pharmaceutical/Cleanroom, Welding/Metalwork.